An extra Sunday night post from Silk — I know I’m supposed to be writing about writing, so I hope everyone will forgive me for this brief side-trip into the War zone. I sat down tonight to write my Monday post, but writing just wasn’t on my mind. Like an occupying force, War had moved in to my thoughts and pushed aside normal things. The things we take for granted. It made them seem smaller and less important. Last night, we watched a National Geographic series on World War II – what we now call ‘The Great War’. It was carved into hour-long segments and was probably meant to air once a week, but as a prelude to Remembrance Day (Veteran’s Day in the US), they ran it as a relentless 4-hour saga. It was honest, brutal and heartbreaking. But I couldn’t look away. 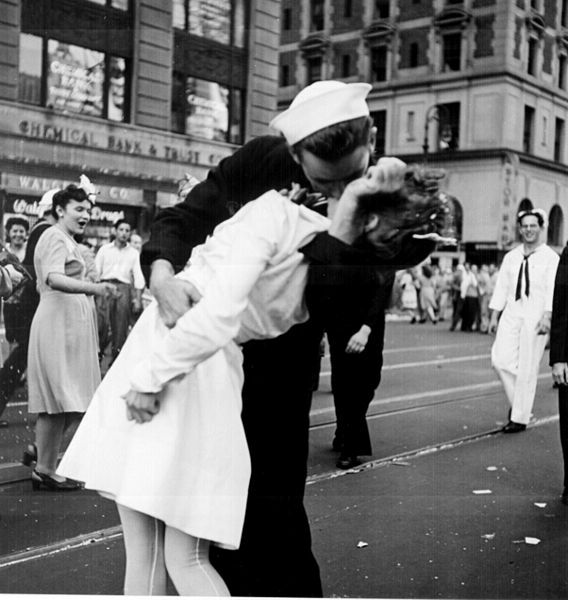 V-J Day 1945, Times Square. World War II was the war that gave my generation its understanding – and mythology – of War. The righteous cause. Defense of freedom against evil incarnate. Clear heroes and villains. Times Square filled with uniformed celebrants and their slim-skirted girlfriends, beneath a rainfall of military caps launched in the air at the news of Victory. Memories our parents passed on to us, since we were yet to be born. The National Geographic series depicted the other memories – the ones our parents didn’t want us to see, wanted to protect us from. My generation – the fabled boomers – came of age during two very different wars that defined us. 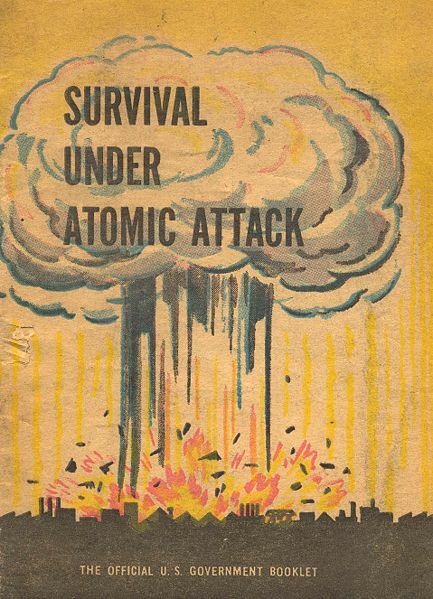 First was the Cold War, when we were marshalled out of our elementary school classrooms in Air Raid Drills to line up along the corridors of the school basement against the wall, crouched on our knees, hands over our heads like hostages. This taught us the concepts of ‘enemy’ and ‘terror’ in the name of Civil Defense. 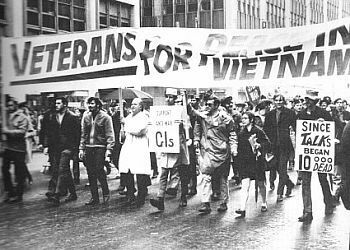 Second was the Vietnam War, which was, illogically, never dignified by a formal Declaration of War by Congress. No wonder. Logic was in tragically short supply during those years. Vietnam was tragic in so many ways, and one proof is Hollywood’s treatment of this chapter in history. There were few inspiring propaganda movies made about Vietnam. Few (if any) boy-meets-girl, boy-goes-to-fight-evil-and-comes-home-a hero, boy-finds-girl-waiting-for-him movies. And zero comedies. Instead we got stories of ambiguity and psychological torment like The Deer Hunter, Born on the Fourth of July and the masterpiece, Apocalypse Now. Today, War is still hell, but is even less easy to understand. It has become a kind of shapeless terror, a name for what we dread, and for unfathomable hatreds and miseries and violence that seem more an expression of social dysfunction, moral chaos and tribal paranoia than a battle between ‘sides’. Today, War has no bright lines. It’s a shape-shifting shadow, a pool of blood soaking into the sand. At 11:11 this morning, I stopped what I was doing and sat still for a while, trying to gather my thoughts and feelings in an act of respect for those who go to War. I focused on being thankful for their sacrifice and bravery. But try as I might to think positive thoughts, War just mocked me and filled my inner eye with images of cruelty and waste. Once, there was hope that World War I would be ‘the war to end all wars.’ Perhaps some still hoped that World War II would finish the job. I don’t hear anyone talking anymore about the strategy of fighting a war to end wars. So my deep hope, my wish for the world, is that we come together to find a better way to end all wars than to keep fighting them in the name of peace. Because they must end. I do have something to say about writing in all this. Much of what non-combatants know about War comes from the stories that writers risk their lives to tell us – from war correspondents and their camera crews, to soldier-poets. 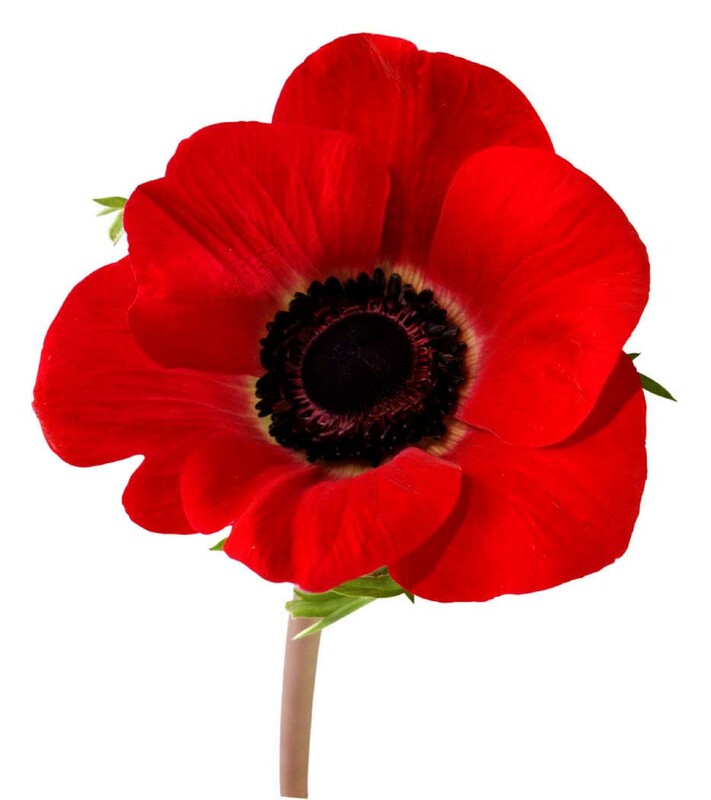 Let’s remember and thank them, too. And let’s listen to them. Peace be with you and all that you love. This entry was posted in Writing and tagged journalists, National Geographic, remembrance day, Veterans' Day, war by Silk Questo. Bookmark the permalink. Very moving. Thank you from the mother of a soldier. My privilege, Bev. The thanks belong to you and your child. Very moving, but I don’t share your optimism (assuming it wasn’t merely a stylized uplifting end). The need for clear heroes and villains, and the further need to see one’s self as the hero (for which one needs villains) does not make an end to war all that likely. Their form may change, from great clash to asymmetrical skirmishes, but I doubt wars will end.